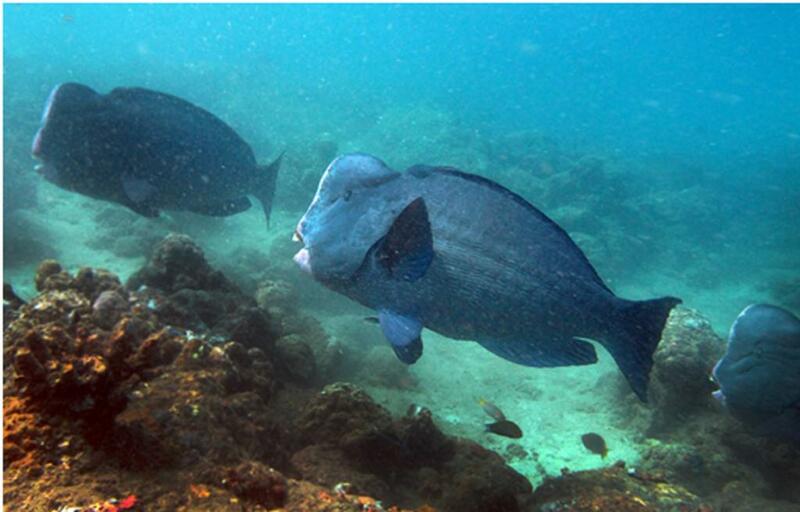 Coral cover protection along the existing protected marine areas in Andaman and Nicobar islands is necessary for conservation of the endangered bumphead parrotfish, a new study has suggested. Bumphead parrotfish, Bolbometopon muricatum, is an important component of coral reef ecosystem, but is highly endangered globally. It is categorized as ‘vulnerable’ in the Red List of the International Union for Conservation of Nature (IUCN). This fish is a highly prized resource, but is threatened due to limited knowledge about its distribution and abundance in Indian waters. A group of researchers recently studied the distribution, abundance and dangers to this species in the waters of Andaman and Nicobar islands. “A large body size, aggregating behaviour and limited activity at night make B. muricatum an easy target for spear-fishers. Combined with slow growth and low replacement rates, this has resulted in population decline across the Indo-Pacific and Red Sea regions,” said Vardhan Patankar, a marine biologist from Wildlife Conservation Society of India. The team carried out underwater visual census, between November 2013 and April 2015, at a total of 75 reef sites across 51 islands, using underwater camera. They recorded 59 individuals of parrotfish across nine sites from the northernmost island in the Andamans (Landfall Island) to the southernmost island in the Nicobars (Great Nicobar Island). During the study, the scientists also spoke to about 100 fishermen regarding the awareness and perception of this species. From the interviews, they collected data on the intensity of fishing, ethnic heterogeneity of the fishing community and the diversity of fishing gear used. The team found that the fish occurs unevenly, with most sightings from only two islands, and with a very small density. It also emerged that free diving spear-fishers exclusively target the aggregations of this fish during night. The study reports that the presence of a protected area, live coral and algal cover, significantly influenced the distribution and abundance of B. muricatum. Incidental catch by fishers and degradation of coral reef habitats are two potential threats to the species. “Evidence of low abundance of B. muricatum on ocean reefs surrounded by deep waters, and traits such as limited dispersal and gregariousness, could also have influenced the distribution and abundance of this fish,” said Tanmay Wagh, another member of the team. The findings suggest the necessity to ban night fishing for the species and to implement regulations regarding reef fishing. Considering the vulnerable status of Bumphead parrotfish globally, the species could be a flagship for educational campaigns focusing on the importance of conserving similar fish groups and protecting the coral reefs.